A software update is now available that makes several adjustments to enhance the overall experience. The software version after this update will be 1.1, as shown in this image. 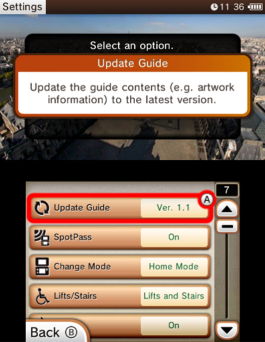 To update the software, please start the game while your Nintendo 3DS or 2DS is connected to the internet, then enter the Settings Screen from the title screen and select “Update Guide”. You can scan this QR Code using your Nintendo 3DS or Nintendo 2DS system to go directly to the game update download page in Nintendo eShop. Find out how to scan the QR Code here.